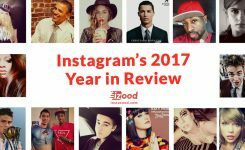 How to Get Rid of Instagram Ads and Sponsored Posts? 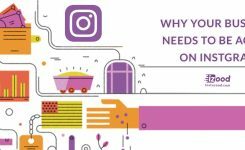 Have you ever wondered about removing an ad from your Instagram feed? 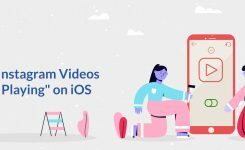 While you can’t stop ads from showing up in your feed, we will show you how to delete individual ads you don’t want to see. All you need to do is click on the reporting option which is in the three dots on the upper right corner of your screen. 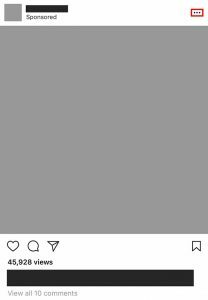 So, If you see an ad in your feed, all you have to do is click on the three dots button and tell Instagram that the ad is inappropriate. 1- Tap the three dots button in the top-right edge of the ad you want to hide. 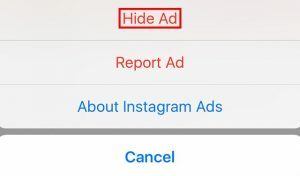 3- After you hide the ad, Instagram will ask you why you didn’t like to see the ad. you can respond by choosing one of three options: “It’s not relevant,” “I see it too often” or “It’s inappropriate.” If you’d prefer not answer this question, keep scrolling on your feed and the question will disappear.